PHOTO BY REBECCA RAFFERTY "Untitled #11" from Keith Howard's "Atom" series, currently on view at Gallery r.
Two shows currently on view at RIT galleries explore the work and legacy of the late artist and educator Keith Howard. Hosted in two parts at Bevier Gallery (James E. Booth Hall 7A, RIT Campus, 73 Lomb Memorial Drive) and Gallery r (100 College Avenue), "Flux: Keith Howard and His Legacy" commemorate the life and work of the innovative artist. While teaching at RIT, Howard developed processes for non-toxic printmaking which are now used internationally. 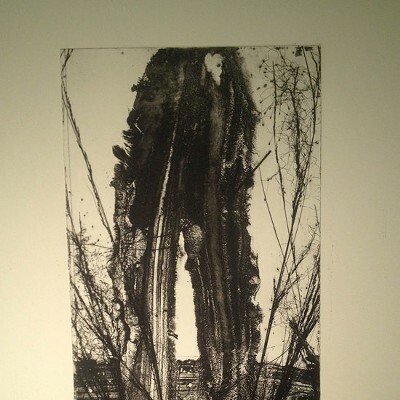 Gallery r features a selection of Howard's Intaglio prints; at Bevier Gallery, the celebration is exhibited through a showing of both Howard's work and that of his students, colleagues, and friends who he has influenced or impacted. Each show closes on Sunday, January 10. 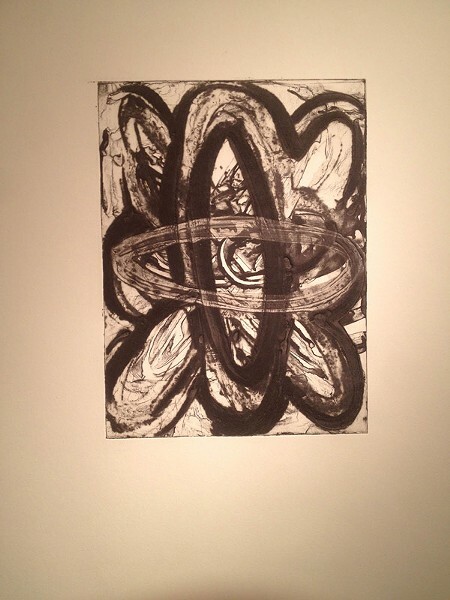 Curated by Howard's widow, Bernice Cross, and RIT grad student and Howard's former student, Shane Durgee, the print show at Gallery r spotlights dozens of examples of Howard's diverse oeuvre in various scales from many different bodies of work, including pieces from his "Boat," "Atom," "Moon," and "9/11" series. From that first group, we see the suggestion of canoe-shaped vessels pushing through ribbons of bubbling water, as in "Untitled #30." "Untitled #10" seems less like a boat than a boat-shaped portal, standing upright against the horizon line of a marshy landscape. In "Untitled #12," an image of a fetus is curled within the vessel as it crosses a series of watery thresholds, compounding the metaphor. 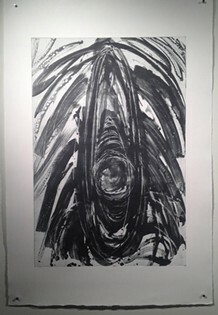 All works are characterized by Howard's knack for dimensionality, whether suggested through the forms and textures in his images, or directly through a thick application of ink and embossed paper. 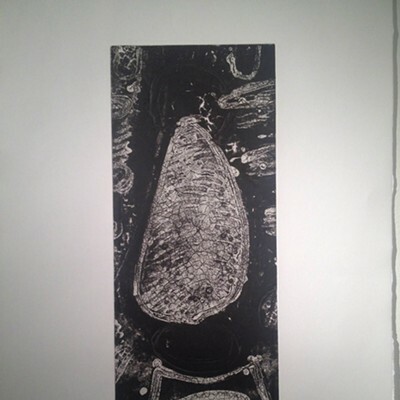 The "Moon" prints are all about implied, crackling-coarse texture, with some overt spherical forms floating in the void, and others with shapes that vaguely resemble crafts coming in for a lunar landing. 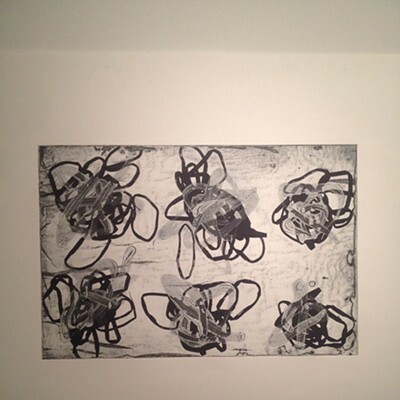 Howard's prints from his "Atom" series are comparatively smaller than the "Boat" works, and considerably more frenzied, depicting the balance between chaos and order, and the 'emptiness' that is actually teeming with these tiny bodies. Like the Boat prints, the vessel is still a factor, depicted here through the same oblong, enclosed form that marks the path of orbiting electrons. The bulbous forms in "Untitled #25" remind me of a grid of bees, vibrating energy outward as they hover in or zip around space. Slideshow "Flux: Keith Howard and His Legacy"
Created in 2001, Howard's large-scale "9/11" prints convey the horror of the pivotal events of that day. Focusing specifically on New York City, they are effective portrayals of the pandemonium that came crashing down after the towers. 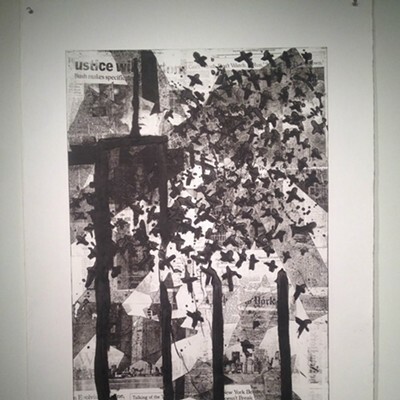 "Can't Watch, Don't Watch, Run" is a visual cacophony of newspaper clippings about the tragedy and its fallout, including some fragments formed into the Stars of David many times over. And over everything, a swarm of black crosses fills the sky around the outline of two iconic columns, like the inerasable memory of choking plumes of smoke. Gallery r is open Wednesday through Sunday, 1 to 5 p.m. For more information, call 265-3312 or visit galleryr.rit.edu. Bevier Gallery's hours are Monday through Friday 9 a.m. to 4:30 p.m.; Monday through Thursday 7 to 9 p.m.; Friday 9 a.m. to 4 p.m.; Saturday 1 to 4:30 p.m.; and Sunday, 2 to 4:30 p.m. To contact Bevier for more information, call 475-2646.